Hooray! Basil is in season and that makes summertime Napa Valley Cabernet season. You might think the warming temperatures make it Riesling and Rose season, and I can’t fault your logic or good taste. But, when a profusion of summertime basil hits your farmers market or supermarket, you need to revisit Nap Cab, because it is the THE most awesome pairing if that basil is turned into the classic basil pesto sauce. 1-The sweet anise-herbal notes of the basil in the pesto pick up the licorice/cedar/herbal notes in the scent and flavor of the wine. 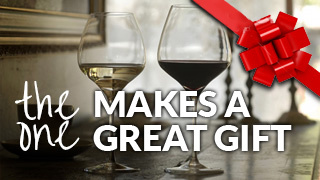 2-The pesto’s parmesan and olive oil richness and fat tame the tannins in the wine, allowing the fruit flavor to pop. 3-The wine’s tannin and acidity cut through the fatty richness of the pesto. I kept it simple and tossed my freshly-made pesto with pasta, but you can mix it into mashed potatoes, toss it with gnocchi, fold it into an omelet, brush it onto fish fillets or chicken breasts or brochettes, or just make a crostini on crispy toast. Easy, and awesome. No steak needed. 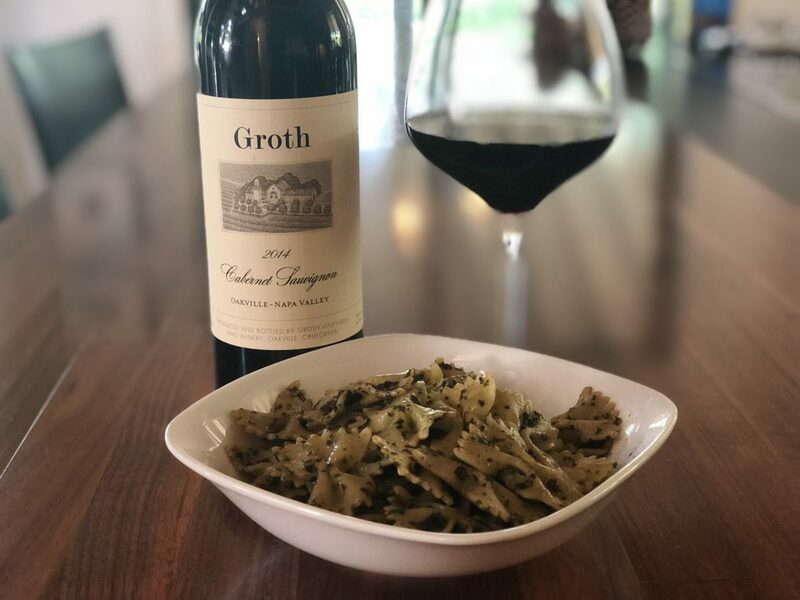 This Groth Cabernet Sauvignon 2014 is drinking beautifully with the basil pesto pasta. Here’s a quick pesto primer: Use a food processor. Process one peeled and trimmed garlic clove with 3 oz cubed parmesan until the texture of panko breadcrumbs. Add 2 cups packed fresh basil leaves and process to shred the leaves. Add 2 teaspoons freshly squeezed lemon juice, a pinch of salt and 6 grinds of freshly cracked black pepper. Turn on the processor and drizzle in olive oil in a thin stream until you have an emerald green, smooth but not too oily sauce. Taste and adjust seasoning, then use it right up before the green color oxidizes. (It still tastes great after this happens so you can use up the rest of the sauce up to 3 days after making it). Enjoy!